We love pork! Seriously, pork might be our favorite meat and does it get any better than pulled pork? It is battle of willpower not to over-indulge on this every time we make it because it is just that delicious. What’s great about pulled pork is how easy it is to make and what little work goes into making a big batch of crockpot pulled pork for a meal and plenty of leftovers. Just start with a high-quality pork shoulder, add a simple rub and throw it in the crock pot with a little chicken stock to cook on low. Cook it “slow and low” as they say for about eight hours and you’ll have a batch of fall off the bone pork that will shread easily with a couple of forks. 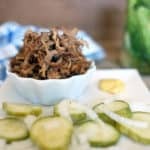 This crock pot pulled pork is really amazing, and we love being able to throw it in to cook in the morning and come home to a great smelling meal in the evening. Nothing is better than coming home from work with your dinner already waiting for you! Don’t let the long cooking time deter you, this recipe is really simple and easy. Try this out and you won’t be disappointed. I’m drooling just looking at the picture. If you try out this recipe, let us know what you think by leaving a comment below and adding a rating. Also, take a picture and tag it on Instagram #realsimplegood so we can check it out! 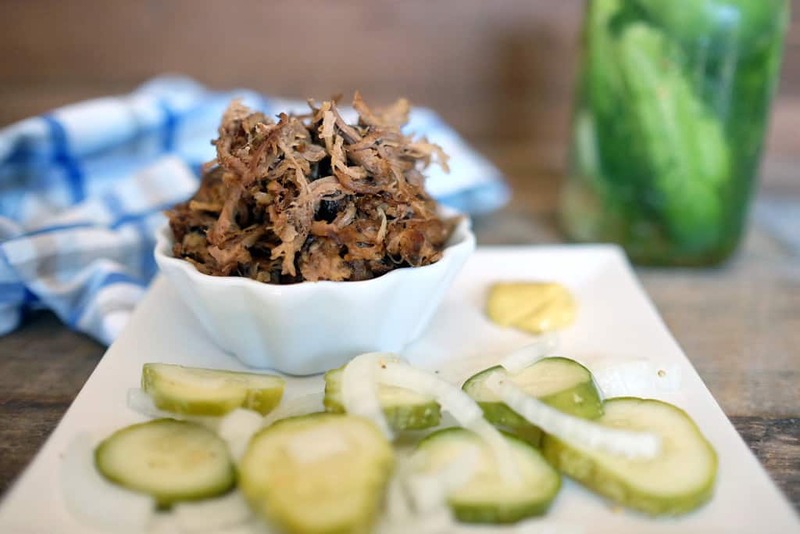 This crock pot pulled pork is easy to make with a simple rub & great flavor. Just throw it all in the crock pot and you have an easy Paleo + Whole30 dinner! Massage the spice rub all over the meat. You may have some left over if you have a smaller cut of meat. If you have the time, wrap and refrigerate the meat for 3 hours or as long as 24 to let the rub set in. If you are planning ahead, I recommend letting the rub set in. If you don't have the time, just season the pork and start cooking. Place the pork into the crock pot, pour the chicken stock in. Remove the pork from the crock pot and place it on a cutting board. Shred with two forks or tongs and serve. I’m making this today with smashed plantains! I see pickles in your picture do you have a good recipe for them? Hi Kasia – We are spoiled because my Mom makes the best pickles and she always gives us some. Those are what are in the picture. I’ve made her recipe but I don’t have it written down anywhere. But here’s a link to an easy refrigerator pickle recipe. I’ve made these before and they are easy because you don’t have to seal the jar or anything. I added garlic to the recipe too and they turned out great. Let us know how the sliders turn out! Can you use this recipe with boneless pork shoulder? Just cook it for less time? I have an 8# roast how long should that cook? If you can fit that large of a roast in your slow cooker I’d recommend cooking it for 12 hours on low. my crockpot recently broke, how could I make this in my oven? Also, it sounds like it’s time to get a new crockpot!